I love playing with Nuvo Mousse and I love the mod background I created with some of the stamps from the Essentials by Ellen Fat Pants & Modern Christmas stamps, both by the amazing Julie Ebersole. create background paper/DIY shimmer paper like my card. The Nuvo Aquamarine Mousse matches the Hero Arts Tide Pool ink beautifully. And I love these for applying mousse to large areas. Mother of Pearl Mousse is super easy to tint with ink pads & reinkers. To create my green holly, I swiped Hero Arts Lime Green ink onto my craft sheet, added a little scoop of mousse and swirled until blended. Craft-A-Board is the perfect surface for mousse. I used it for my holly & berries. 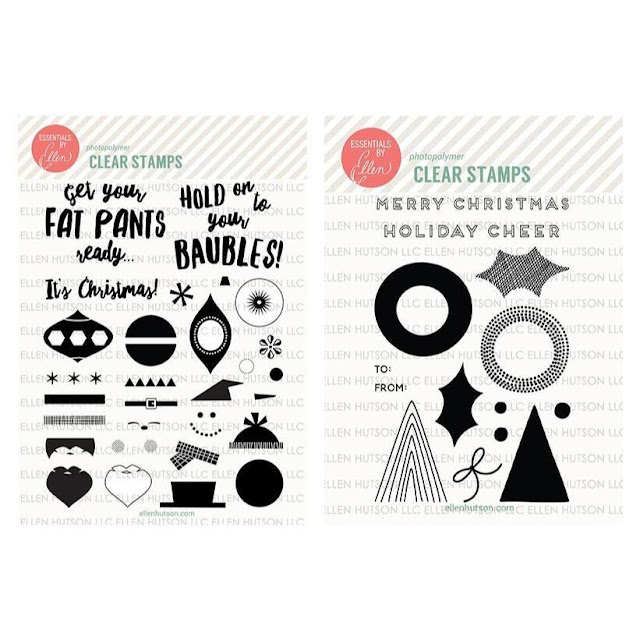 And a little help from your friendly crafty enabler (me), the Fat Pants & Modern Christmas sets are on sale right now as a sweet bundle. Hope you have a wonderful, crafty day! Hugs!